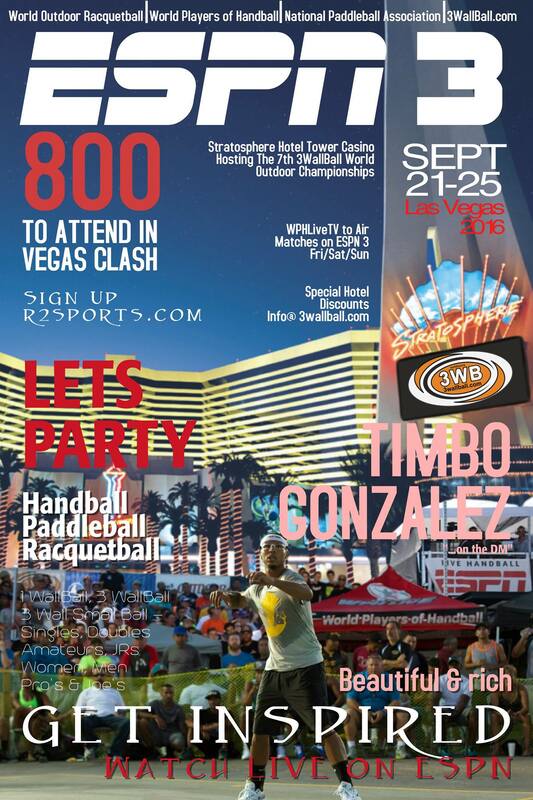 September 21st-25th, 2016, brings us to the seventh year of the 3WallBall Outdoor World Championships in Las Vegas, NV @ the Stratosphere Hotel Tower Casino; combining Racquetball, Paddleball, & Handball all in one event~one venue …and you are invited! In Handball, play includes 1 wallball, 3wallball (big ball) & small ball 3 wall with divisions for amateurs, women, pros, juniors and age brackets. Past participants of this event include Dave Chapman, John Bike, Naty Alvarado, Sean Lenning, Emmett Peixoto, Tracy Davis, John Rookie Wright, Timbo Gonzalez, Tywan Cook, Danielle Daskalakis, Sandy NG, Tyree Bastidas, Willie Polanco, Robert Sostre, Kadeem Bush, Cesar Sala, Gollo Tellez, Juan Santos, Samzon Hernandez, Armando Ortiz, Luis Moreno, Nik Nahorniak, Tanisha Groomes, Gio Vazquez, Pee Wee Castro, Shorty Ruiz, Justin Richie, Marty Hogan and more. Over 200 combined national & world titles! In 2015 over 300 handball players joined in on the action!!! Hotel Discounts available and you can stay right above the courts! Stratosphere Hotel info HERE>Will ESPN be back?